Fans of Bastion have been anxiously awaiting Transistor, the latest game from Supergiant Games. 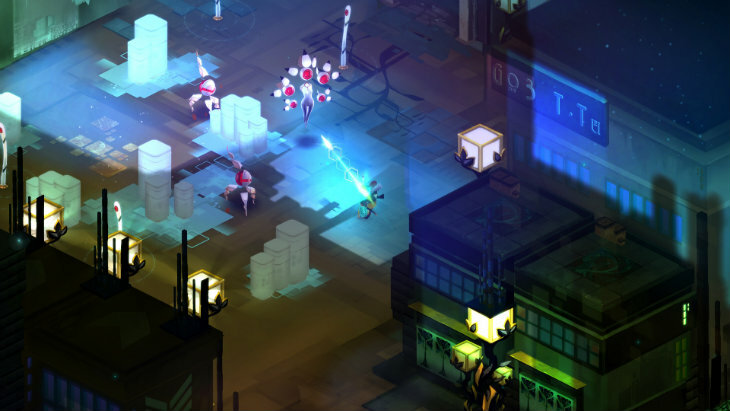 Known for their fantastic aesthetic, Supergiant doesn’t disappoint with Transistor. But that doesn’t mean gamers should expect this to be like Bastion – while some visual and aural experiences are similar, this game offers a completely different experience. Players take on the role of Red, a beautiful singer taking on the world with her faithful sword transistor. The transistor is voiced by Bastion’s narrator, Logan Cunningham. He speaks continually throughout the game, guiding Red as she journeys through the cyber-punk science-fiction-heavy city of Cloudbank. The transistor’s turquoise colour is matched in the PS4 controller’s light bar, flashing as he speaks. This certainly adds to the immersive experience, and the option to use the Dualshock’s speaker – off by default – for the sword’s audio enhances that immersion even further, making it feel as if the player is truly holding that sword. To say the game is stunning doesn’t do it justice. Each aspect is exquisitely crafted, from the detailed environments to the gorgeous cut away moments of Red eating pizza or watching the sunset while lying in a hammock. As incredible as the visuals are, the audio experience is even more impressive. The soundtrack is rich and varied, taking each locale and battle to a new level. To top it off, the character was a gifted and beloved singer who still has strong musical abilities – at any point outside of combat, the player can let her hum, letting her vocal abilities perfectly complement the existing song for that area. It is subtle and heartbreaking – this is a soundtrack that I will need to download and listen to on a regular basis. 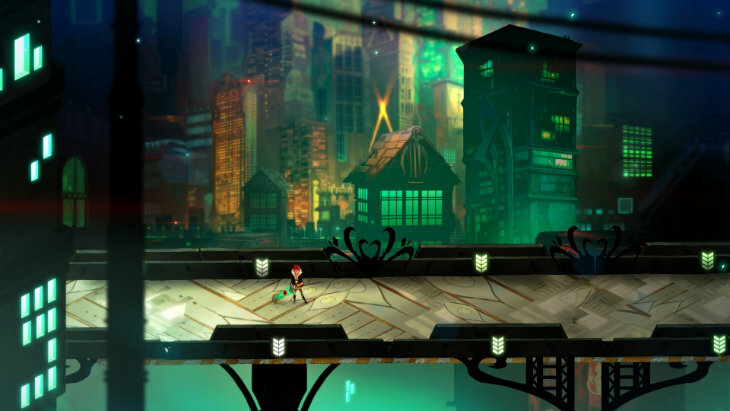 Those drawn to Transistor may think that it’s all about the aesthetic, but the combat is even more impressive. As you progress through the game, you acquire new functions – these were formerly people who are now absorbed by your transistor and converted into battle-worthy elements. Each function can be placed in an active, upgrade or passive slot. For example, the ricochet function is a relatively weak attack as the active power, but when used as an upgrade it can make your powerful shot bounce from foe to foe. You might think that’s the best use of the function, but actually, I ended up keeping it in the passive slot by late game thanks to the passive shield that it granted. Moving functions around isn’t just for experimenting with play styles and maximum damage. Because each function was actually a character, if you want to know their full story, you need to play with each function in each type of slot. This helps to promote experimentation, although it can feel like a negative trade off – you might have to take on a weaker combination of functions just so that you can know what actually happened to the characters in the story. 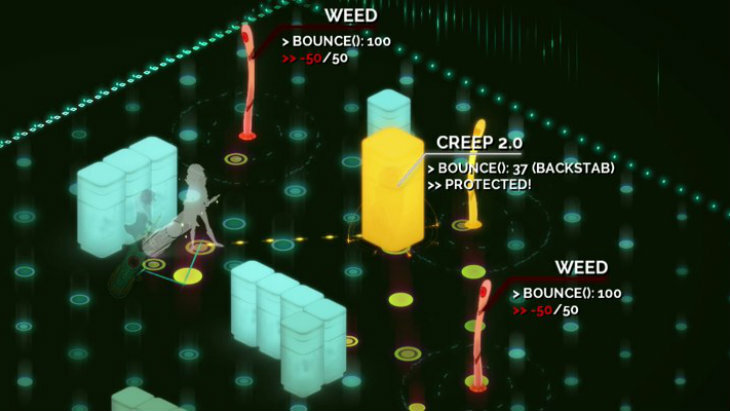 Transistor’s combat is strategic and genius. Beyond finding the perfect combination of functions for your play style, there is deep strategy in each enemy encounter. You can choose to attack in real time, shooting off your skills as you see fit. Or, you can take advantage of the turn-based approach, freezing time and perfectly planning each turn. While this can be extremely effective when killing off a variety of enemies, it also leaves you vulnerable. After your pre-planned turn is completed, you are unable to attack (unless you have a specific function as an upgrade) until your turn recharges. Each turn decision involves managing power, weighing risk with reward. By the end of the game, it becomes a bit standard, unfortunately. Despite ever-evolving enemies, even the final boss poses minimal risk as you will probably end up following your same standard strategy with your same favorite functions. Functions serve another purpose, though. Beyond giving you attacks and passive abilities, they are also the way to get a second chance when your life bar runs out. Rather than dealing in lives, Transistor sacrifices one of your functions when your life bar is emptied. This means that you can carry on with battle, albeit with greater difficulty. Players have no choice as to which function is taken away, and you can only regain those abilities after reaching a certain number of access/save points in the game. 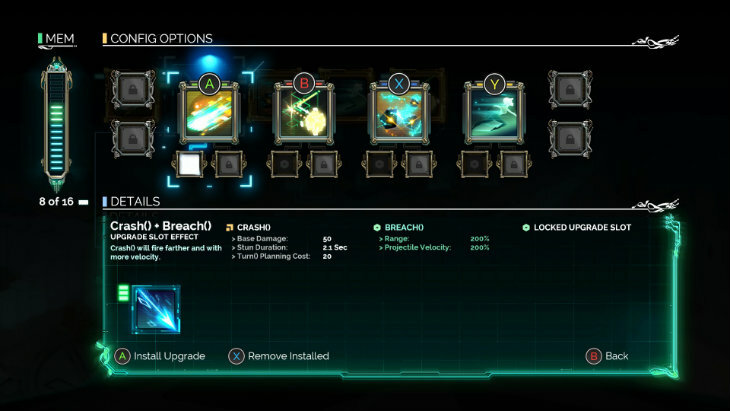 This also forces players to change from their standard ability load out – using functions in different ways until they regain their preferred abilities. 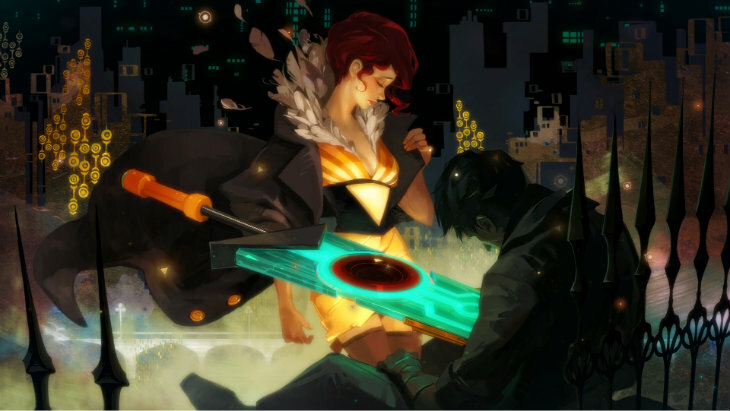 Unfortunately, the greatest downfall of Transistor is its storytelling. Most of the story is told through reading character descriptions. Without reading the descriptions, you get a general sense of this evil “process” that runs the city based on a consensus that is ruined by a few elite. However, without gaining each function/character and reading their entire description, it just feels disjointed and confusing. The characters are fully explored in their descriptions, but without thoroughly reading each one, it ends up feeling like they aren’t really developed or explained in the game. Ultimately, I found the story of the game less than satisfying – it simply didn’t have the same soul that I was hoping for after playing Bastion. Transistor is available on PS4 and PC for a very reasonable $20. The experience of Transistor is lush and enjoyable. It is a beautiful game with some truly excellent mechanics. Unfortunately, its story and lack of character development through gameplay brings the rest of the game down - but not by much.